You can view the history of all Gradebook changes in your course using the Gradebook History page. 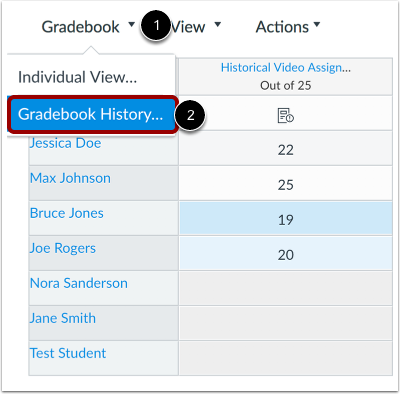 Gradebook History is a read-only log that allows you to see who graded each assignment. Options are available to filter grading history by student, grader, assignment, and date. For quizzes, you can view historical data for any regraded quizzes. Note: Gradebook history displays changes made within the last 365 days. Click the Gradebook menu  and select the Gradebook History... link . The Gradebook History page displays recent grade changes in the course. Each grade change lists the date of the change , the student whose grade was changed , the grader who changed the grade , and the assignment where the grade was changed . Additionally, you can view a summary of the grade before it was changed , after it was changed , and the current grade for the assignment . 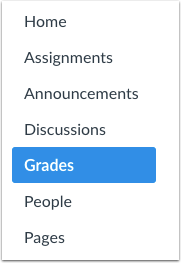 Note: If you are grading in a course where you can only interact with users in your same section, the Gradebook history page will only display results for users within your same section. Any grade changes related to an anonymously graded assignment do not include student names in the search results . If the anonymous grading option is removed from the assignment at a later time, the Gradebook History page displays an icon showing that the assignment was previously graded anonymously . If you want to locate a specific grade change, you can filter grading history by student , grader , assignment , and start or end date . To filter grading history by student, grader, or assignment, start typing the name in the search filter. Canvas will automatically populate matching names. Select the name from the results . If you also want to filter grading history by start or end date, click the date field  and then select a date from the calendar . To apply your specified filters, click the Filter button. 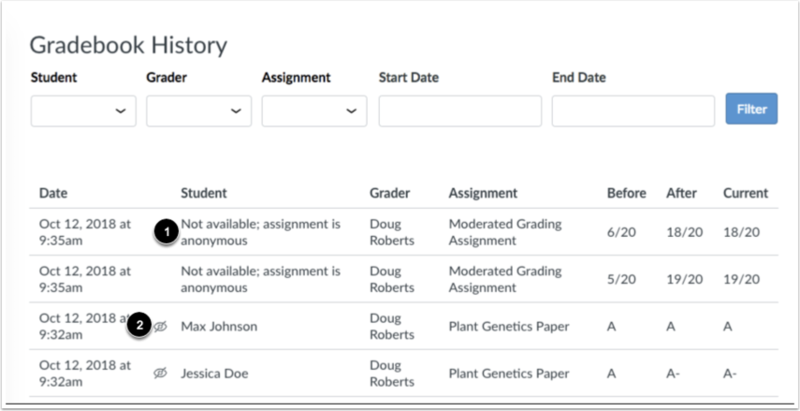 Previous Topic:How do I publish final grades for a moderated assignment in the New Gradebook? Next Topic:How do I view a student's Grades page in a course from the New Gradebook? Table of Contents > New Gradebook > How do I view the history of all grading changes in the New Gradebook?